This a brand new Brown Top Quality saddle bag fits 2004-2018 Sportsters, Nightster, Iron, 48. The entire Bag is made of Heavy Top Grain Veg Tannend Leather.The Sides of the bag are Reinforced with a second layer of leather that help the bag keep it's shape. The bag is attached with extra high tensile strength zip ties that are fixed over leather traps that wrap around the frame. Bag is designed for Left Side Mounting. This bag is the Black leather, but can also be made in any of the styles and colors as well as any of the other leathers found in my store. You can have it made to match your seat. The bag is 4" front to back, 16" wide at the bottom, 10" wide at the top 6" tall on the short side and 10" tall on the long side. 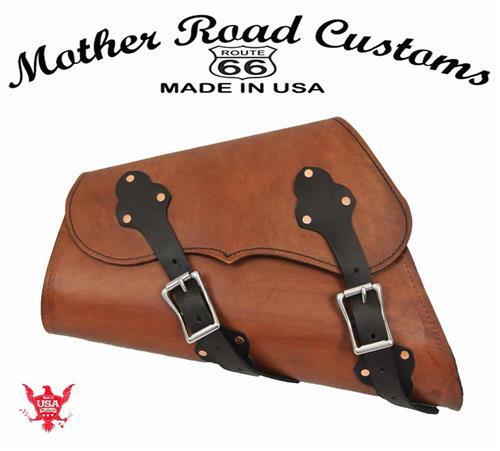 You can now have a Saddle bag or Tool Bag made to match almost any seat that you would like to buy from Mother Road Customs. The straps, to close the bag with, are 1" wide veg tanned cowhide. The buckles that close the bag are 1" wide heavy duty solid stainless steel. I use only high quality, long lasting, materials. It is sewn together with heavy duty nylon thread. I can make this bag to match almost any of my seats. If you have a question, or need something custom you can call me at 314-972-4305.